The practice of periodically reinitializing the level set function is well established in two- phase flow applications as a way of controlling the growth of anomalies and/or numerical errors. In the present work, the underlying roots of this anomalous growth are studied, where it is established that the augmentation of the magnitude of the level set gradient (|? 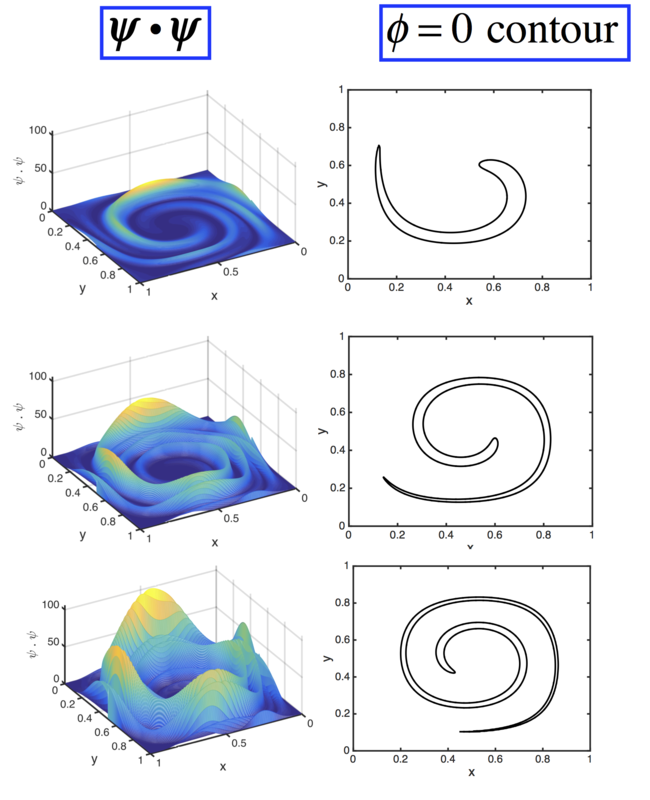 ?|) is directly connected to the nature of the flow field; hence, it is not necessarily the result of some type of numerical error. More specifically, for a general flow field advecting the level set function, it is shown that the eigenpairs of the strain rate tensor are responsible for the rate of change of |? ?| along a fluid particle trajectory. This straining action not only affects the magnitude of |? ?|, but the general character of ?, and consequently contributes to the growth in numerical error. These numerical consequences are examined by adopting the Gradient Augmented Level Set method. Specifically, it is shown that the local error for ? is directly connected to the size of |? ?| and to the magnitude of the second and fourth order derivatives of ?. These analytical findings are subsequently supported by various examples. The role of reinitialization is discussed, where it is shown that in cases where the zero level set contour has a local radius of curvature that is below the local grid resolution, reinitialization exacerbates rather than diminishes the degree of error. For other cases, where the interface is well resolved, reinitialization helps stabilize the error as intended. The association between increasing numerical errors with T for this well known single vortex case, is generally attributed to the diminishing width of the interfacial region, often below the grid spacing ?x. While this is definitely a symptom of a numerical difficulty, the underlying contributor, which is not mentioned in the literature, is the significant growth in norm of the level set gradient. This quantity has direct negative effect on the error magnitude during level set advection.